American Electric Power has done a wonderful thing for the Scioto County Career and Technical Center(SCCTC), as they have donated to the Technical Center, an entire truck. “If we can support the school and the facility, because basically they are supporting our workforce and helping out the community, we felt it was the right thing to give back” Koenig said. 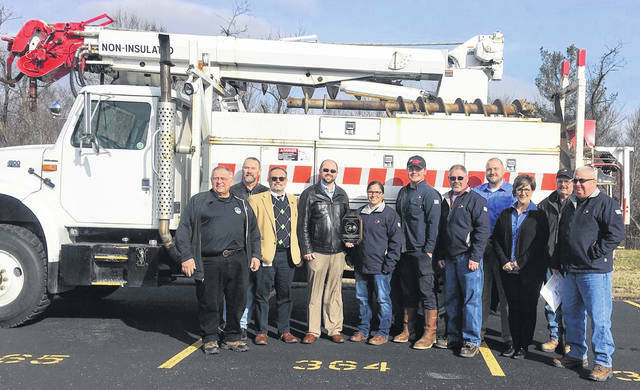 Brown had gathered the folks together that had contributed to this gift, to present a plaque in appreciation to AEP for their support of the SCCTC power line mechanic program and to thank them for their generosity that gives opportunities to their students. “This is one program that has always been very successful since we started, it’s one we are very proud of and we are getting ready to graduate 11 in the program in March,” said Brown. Kenny Renn, the instructor of the class, has been teaching this class for 12 years and said he put 15 classes through and also worked 30 years at AEP in Portsmouth. He says he likes working with the students in the adult lineman classes. This entire group of people, who each in their own way wanted to see the students at the SCCTC be able to work with the best equipment they could get, were all excited to get together for the sharing of the gift for the students of the SCCTC. AEP has some caring people who see that the students of today are the workforce of tomorrow.